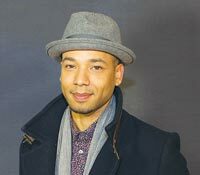 Though he plays the openly gay Jamal Lyon on Empire, Jussie Smollett only admitted to being gay in March, when he opened up about his sexuality in a backstage interview with popular American chat show host Ellen DeGeneres. The Brazilian-American actor and singer-songwriter denies ever having rejected gay rumours, and insists that a�?therea��s never been a closet that Ia��ve been in.a�? In a further interview with Variety, the 31-year-old went on to say, a�?I did talk to her [DeGeneres] so that people understand that theya��re not alone,a�? and strongly believes that his coming out isna��t a big deal. Out and proud since Valentinea��s Day last year is 28-year-old Ellen Page, who took to the stage at the Human Righta��s a�?Time to Thrivea�� conference in Las Vegas to make her confession. With powerful words like a�?I am here today because I am gaya�? and a�?I am tired of hiding and I am tired of lying by omission,a�? the Juno star garnered even more internet fame since then by foul-mouthing the Queen of Englanda��s decision to honour homophobic Northern Irish politician Maurice Mills. And now with multiple movies in the pipeline, ita��s clear that her sexuality hasna��t changed the course of her career.